Somehow, I'd never read any of the Owen McKenna series of books before the author, Todd Borg, sent me a copy for possible review. In fact, I'd never known anything about that area of the U.S. except that there is a lake named Tahoe, lots of expensive homes, a resort and gambling casino (I think). The problem with a lot of locally situated books is that most of us (not in the general area) never get to read them because the authors tend to get pigeon-holed as regional. So I'm glad I had a chance to read this, the tenth in the series - I mean, where have I been? A small boy witnesses a possible murder and is trapped in the bed of the killers' pick-up as it whisks away from the lonely, wooded crime scene. The boy is eight years old and an illegal immigrant, trapped not only under the topper of a truck fleeing through the night, but also outside the U.S. legal system and frightened out of his wits. His 'foster' mom, Cassie, presumably lies dead on a country road. Owen McKenna, ex-cop, current private eye and Tahoe resident, gets a frantic wake-up call in the middle of the night. It is the boy, Paco Ipar, calling on a cell phone from his hiding place. McKenna and the boy have never met but the boy had been told by Cassie to call McKenna in case there was ever any trouble. Paco pleads with McKenna to come find him. Out into the night goes McKenna, desperate to save a small boy. Along the way, we find out how to make fiendish use of stinging red ants and a concoction of pepper spray (from organic peppers, of course) hot enough to fell a couple of very bad men. Did I fail to mention that McKenna is a very clever fellow? We also find out some interesting tomato lore as the missing Cassie has managed to create a strain of tomato that ripens by itself while being shipped, needing no gas to do the job. Oh, you didn't know that the regular tomatoes you find in the supermarket are 'gassed' to make them ripen? I didn't either. Ugh. 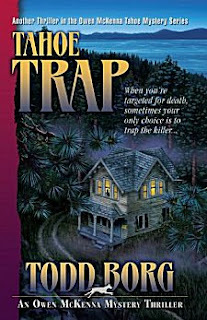 Lots of interesting stuff going on in this fast-paced suspenseful mystery I am definitely recommending and you will want to read. In fact, I've added the rest of the books in this series to my TBR list for future getting acquainted. Oh, and if all this hasn't peaked your interest yet, there's also a Harlequin Great Dane named Spot. McKenna's extremely large dog, along for the ride. To learn about Todd Borg and see a full list of his Owen McKenna books, please use this link. A most unusual story, Yvette! That cover is fantastic and it looks like the kind of mystery I'd reach out for. McKenna seems like a nice guy: I like reading about good people doing good things in a book, mystery or otherwise. Thanks for the link to Todd Borg's list of books. You're welcome, Dave. I finally figured out that your comments are coming through as 'spam' that's why I haven't seen them. At least until I check out the spam section and there you are. Ha! Joe and I were just at Lake Tahoe for the first time back in June. We did some hiking and climbing (and I won some money in a casino!). A truly gorgeous place with stunning views on the mountain trails. I remember it being THE destination for all game show winning contestants. Prizes used to be given away by the truckful for trips to "beautiful LAKE TAHOE!" (to be said in your best Johnny Owens voice) Now I know why. I'd definitely be wiling to read a mystery series set there. Hope Todd Borg sees this and comments. Now that IS a coincidence, John. I think I've only ever known one other person who's been to Lake Tahoe. Sounds like you and Joe had a great time. I love the cover, I think that would have sold me all by itself. I like the sound of the mystery and I like any book that informs unwary consumers on the difference between a fruit and a vegetable. By the way, for it to be a fruit, the seeds have to be on the inside. Check the list of Todd Borg's books, there's plenty to choose from. BOTANY 101: Because some fruits have no seeds either through hybridization (naval oranges) or nature the more accurate difference between a fruit and a vegetable is that a fruit develops from the flower of a plant and vegetables develop from roots (carrots, potatoes, radishes), bulbs (garlic, onions), leaves (lettuce, kale, spinach), or even the flower itself (broccoli, cauliflower). Easiest way to remember the difference: 1. Did you *pick* it off a stem on the plant? Usually a fruit (or a legume - peas and beans). 2. Did you *dig* it up or *pull* it off the plant? Usually a vegetable. I learned all this not from books but from planting and gardening. Doing is the best teaching method! John you are a gardening wizard. Can't do it anymore (except for my parsley, basil and thyme on the front porch) because my lower back won't let me. i've never hear of this series. Sounds good. I acutally know someone who just took a trip to Tahoe, so the setting grabbed my attention too. It's a great setting, Carol. I'm glad to get out the word about Todd Borg's series.